A strategic problem solver with a focus on the future, Ric co-founded Plan B [the agency alternative] in 1998 to provide frustrated marketers and brand managers with a next-generation marketing partner “alternative” that would be both philosophically and operationally different than the bureaucratic corporate agencies that had come to define the industry. Since pioneering what has become a model for a faster, more efficient ad agency, Ric has continued to champion the agency’s core “alternative” positioning in pushing for exceptional levels of client service, highly strategic account leadership, and world-class creative solutions that can keep pace both culturally and with accelerating changes in advertising trends and technology platforms. Under Ric’s steadfast stewardship, the agency has continued to evolve toward meeting the changing demands of an often fickle and fast-changing marketing landscape. He was the principal architect behind the agency’s “4D” approach to marketing, the system by which the agency monitors and optimizes a client’s marketing initiatives in real-time, mixing and phasing paid, owned, and earned media investments in real-time for greater impact. He also designed and refined the agency’s framework for streamlining the development of strategic creative work, ensuring Plan B consistently delivers creative solutions that are as stunningly smart as they are works of commercial art. 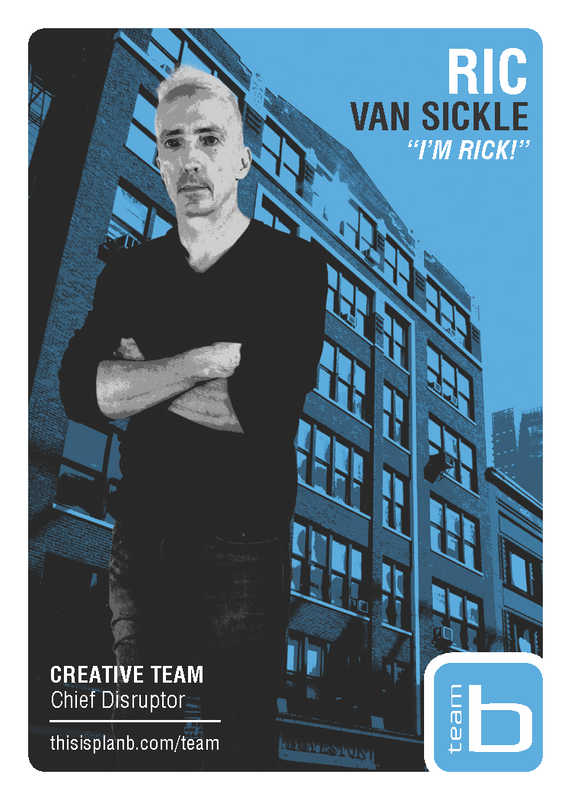 After years building the agency, Ric now maintains global oversight on agency operations, while remaining actively involved at the client level as a senior creative strategist and creative director, helping his teams navigate some of the agency’s more complex marketing programs and creative campaign endeavors. Ric’s many successes over the past two decades as a principal at Plan B are part of a much longer career in the ad world, which includes years of experience at some of the industry’s top shops, including Havas and DDB Worldwide. As both a creative mind and a mentor, Ric has worked on dozens of household and international brands over the years, including Hoover, Equal, Ameritech, Bally Total Fitness, Kraft, Bud Light, Duraflame, Thermos, and Pillsbury, to name a few. Over the course of his career, Ric has led with passionate dedication to his principles, garnering himself a reputation as a digital pathfinder and an international brand management authority along the way. His remarkable ability to combine strong design with breakthrough creative thinking was validated with an early collection of industry awards, including a national Addy, a Clio, and three New York Ad Club National Advertising Awards. Ric has a graduate degree from Kellogg School of Management and has served as adjunct professor of Art and Design at his alma mater, Columbia College. He is a member of the Board of Directors for Jukebox Technology and for fun spends time at the track, racing Plan B’s ’73 VW Fastback in the 24 Hours of LeMons endurance racing series.